You’re a brand who’s built an identity for decades, maybe even 100+ years. The internet has caused a major disruption in how your brand is able to communicate with your end consumers. Today, you have hundreds of channels and retailers sharing content about your brand. And those digital representations influence what consumers think of your brand experience, and ultimately the content consumers see determines whether or not they buy from you. How can you protect the identity of your brand across all of these new places consumers shop? It’s a challenge that every brand faces. If you don’t have a consistent and organized way to submit your product data to each retailer, search engine and product review site across the web, you can lose the critical brand equity you’ve built. Brands who are investing in their people, a process, and technology to respond to these challenges, aren’t just maintaining their identity, they're taking market share from brands who are slow to react. Our latest research found that 87% of consumers start their shopping search on either Google or Amazon. If you don’t control your content across the internet, third parties will try to list your items as well...often with poor content or even out of date/incorrect information. These incorrect listings are what might surface on these critical search engines and marketplaces. Brands that adopt a process, team, and technology to manage their product content have better control over their brand. When you provide excellent content for all of your SKUs, your products rank higher in search results. This results in more clicks and purchases, which in turn means your (real) product listings show up higher in future searches. Ultimately this creates a cycle that continues to result in higher rankings, more clicks, and better sales results. For example, Johnson & Johnson provided high-resolution product images to Google Manufacturer’s Center and saw a 22% increase in impressions and a 27% increase in clicks when compared to category benchmarks. Tackling your product content strategy head on is a natural way to push out the third-party resellers because they’ll never be able to provide the same level of high quality type of brand content that you can. If you are a smaller brands that can leverage great product content to build a strong brand identity and increase market share. Larger brands can use a product content strategy to protect what you’ve built and increase market share. No matter your size, investing in a strategic product content strategy is a huge opportunity for you to jump ahead of your competition. 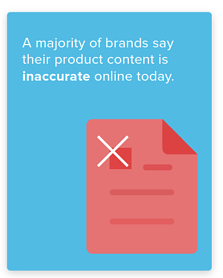 According to our recent market research, a majority of brands say their product content is inaccurate online today. And 62% of brands are still using spreadsheets or homegrown databases to manage product content. To maintain control and visibility into what product content your retailers, distributors, search engines and other partners are using, you must have a reliable, automated process for supplying them with accurate product content. Collaborate internally on creating the best brand content. Adopt a reliable internal process for updating new product content to reflect sales, product refreshes and other changes to your products. Gain visibility and control over accurate product listings. Update and correct product content across search engines, retailers and other distribution partners. Get product content where it needs to go. Develop a fast, accurate onboarding process to get your content to each of your retailer partners in the format they request. Keep the rights to your own content. You know your products and brand better than anyone else. You also need security in knowing what exactly is being said about your brand and maintaining your rights to it. Before choosing third-party content creators, ensure you have ownership over your brand assets. For more information on how brands are working with retailers to update and maintain high quality brand content, download our latest market research, Win the Sale.